With An Evening with Mr & Mrs. Lincoln – You can witness living history by joining the Lincolns in the White House in 1865. 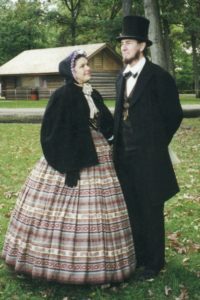 The couple reflects on the tumultuous years of the Civil War and invites you to travel back in time to see the start of their journey together. An in-depth, entertaining, performance will give you an exclusive look at not only Abraham and Mary Todd’s courtship and early marriage, but also the memories they have of starting a family, the development of Mr. Lincoln’s political career, and his presidency. Their stories reveal the personal traumas they endured, as well the significant event at Ford’s Theatre and the outcome that became an integral part of our history. A short epilogue addresses the events of April 14, 1865, and the last years of Mary Lincoln’s life. “An excellent opportunity to witness living history!”. Full course delicious meal, dessert, beverage and show for $39.95 plus tax & tip. Scroll down to make your reservations today!